Chance says his vision for Chicagoist is to "allow more people to have voices, to give a bigger platform for Chicago voices to speak." 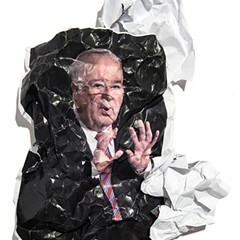 When Chance the Rapper announced via a single in July that he was buying Chicagoist—the hyperlocal news site closed by billionaire owner Joe Ricketts the previous November—there was a ton of speculation about what he'd do with it. At an invitation-only event Friday morning, a collection of journalists, young aldermanic candidates, professors, and supporters got a first glimpse of the goods. 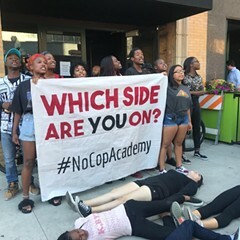 The whole event was shrouded in mystery, and the few folks I spoke to as we waited at Northeastern Illinois University's Jacob H. Carruthers Center for Inner City Studies in Bronzeville were as excitedly baffled as I was about what exactly we were in for. That turned out to be a video, but before it rolled, retired Northeastern Professor Conrad Worrill (a longtime friend of Chance's dad) set the scene by telling us that some of history's greatest black intellectuals and artists had once graced the same stage, among them W.E.B. Du Bois and Langston Hughes. 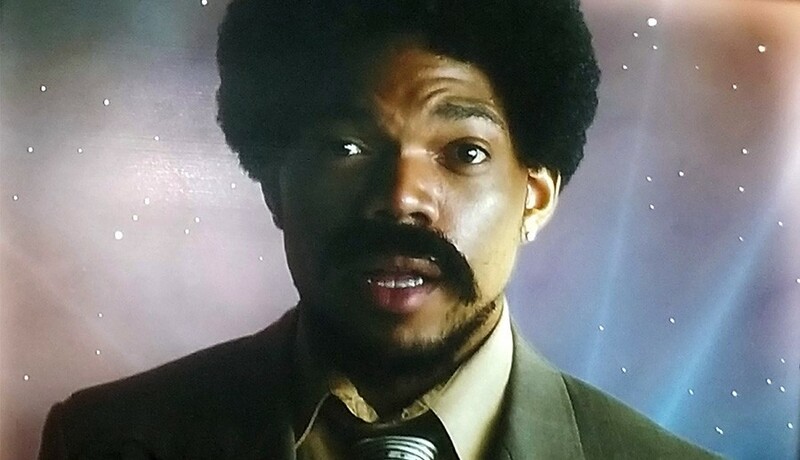 Then the video began: puppet news anchors—that's right, I said puppet—introduce a Chicagoist investigation by "Champ" the reporter, played by young Chance in a beige throwback suit and a taped-on mustache he keeps pressing back into place as he talks. Champ/Chance then delivers a 101-level lesson in Chicago politics, set to music with what Sun-Times journalist Kathy Chaney astutely described as a Schoolhouse Rock vibe. People-on-the-street interviews demonstrate just how little people on the street know about how their city runs. (What does an alderman do? What's the City Council? How many wards does Chicago have? No one knows.) More formal interviews with local reporters and aldermanic hopefuls, many of them people of color (and many of them in the audience watching the video with us), explore the challenges faced by candidates who lack clout, connections, and resources. A bewigged Hannibal Buress hams it up in the role of fictitious 51st ward alderman Al Durhman, who proudly proclaims that he just votes "yes" to everything and has been re-elected for years after inheriting the seat from his daddy. 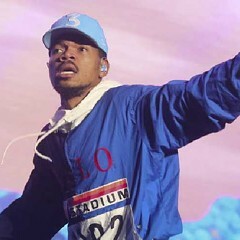 During a Q&A after the video, Chance said it would be posted on his YouTube channel but not on Chicagoist, which he noted is still under construction. 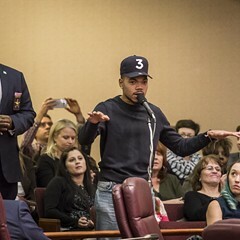 Chance said he was inspired to do the piece by the realization that he'd only learned that the City Council is made up of aldermen when he visited one of its meetings last year—and that this kind of knowledge gap keeps people from being engaged in government and electoral politics. The new Chicagoist has a chance to fix that, and Chance said he hopes to get the video included in the curriculum at CPS. He offered few details about what else Chicagoist is up to, but he promised that it would be "grand"—and that it would offer its audience more context for the news of the day. 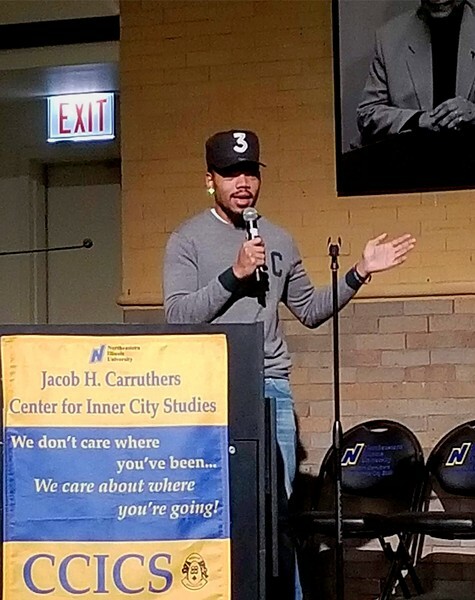 "The overall idea is to allow more people to have voices, to give a bigger platform for Chicago voices to speak," Chance said—not just in the realm of hyperlocal journalism but also in the world at large (including, of course, in music). "I'm not trying to say too much, but it's cool, though—it's a cool thing." 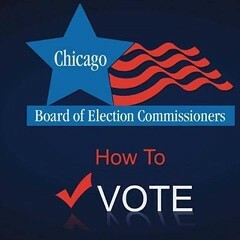 Cast your ballot for mayor, city clerk, city treasurer, and alderman now through February 25 at more than 50 sites across the city.